When Google announced its ARCore augmented reality toolkit for Android as its answer to Apple's ARKit for iPhones and iPads, the question from many observers was, "What about Tango?" For at least one app Tango app developer, ScapeHop, the answer is to move to ARCore, and don't look back. 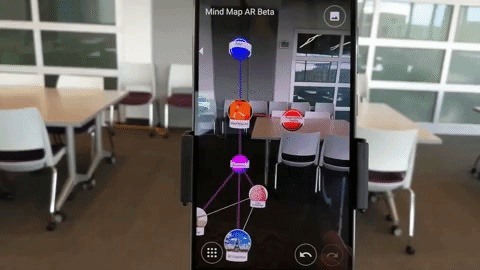 A pre-release beta version of ScapeHop's Tango app, Mind Map AR, is available for download from the Play Store. However, according to developer Dante Martin, founder and CEO of ScapeHop, they have ceased work on the Tango version to focus on migrating the app to ARCore. "We are not losing functionality with the change, and the move from Tango has not been too bad. I'm glad we were able to reuse as much of our original code as we did. 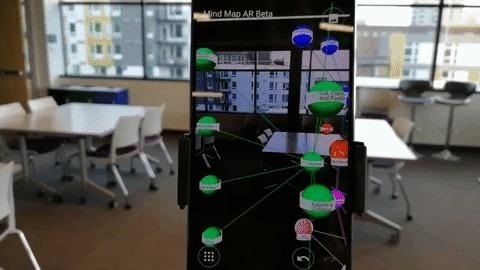 Ultra-sensitive depth sensing is not as critical for our app, so ARCore allows us to deliver a convincing AR experience. In fact, it's working more smoothly than the video posted on our site right now," said Martin. For the uninitiated, mind maps are a spatial charting technique that emulates the human brain's ability to organize related concepts. When represented in 3D via augmented reality, users can build mind maps on a larger, room-sized canvas versus a 2D whiteboard. The Tango version is fairly intuitive. I was able to jump right in and add nodes to the map. Tapping a node gives users a radial menu of actions for adding and editing information, and the map expands and contracts with a pinch gesture on the screen. The map anchors solidly to its assigned space, and users can walk around the model to view the various branches more closely. ScapeHop is continuing to prepare the ARCore version of the app for its debut on the Play Store; they expect to have it ready by the end of November. "Much of our work right now is focused on the UI and touch targets to make using the app more easy and intuitive," said Martin. The company is also planning to develop an iOS version of the app based on ARKit at some point in the future.